Did I mention they were black? And, so, so scary! Look – she has a machine gun! She looks very angry. Those black women are always angry about something. And he’s a Muslim! Told you! A scary, militant, terrorist Muslim – coming to your White House. Look at them – what is that they are doing with their hands? The terrorist fist bump! Ahhh – run for your lives! See – this is supposed to be satire, because it’s the New Yorker, y’all. That’s the liberal press. 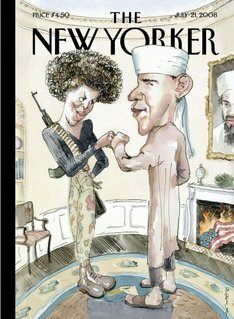 But how many people will see the image on this cover and have their fears about the Obamas even more deeply ingrained? ht – Diary of an Anxious Black Woman, What About Our Daughters. Depicting racial imagery to “fight” racism is not acceptable. This is not the work of an ally. UPDATE: More (including contact info) here and here (and lots of other places).